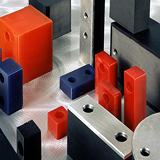 Rubber bumpers and urethane bumpers, designed to guard, stop, align, and protect a machine or work piece during the manufacturing process. They are available in round, square, and rectangular shapes (standard and custom sizes available) with a variety of different styles that integrate well into an industrial application or commercial end product. These bumpers are available in black neoprene, white nitrile, or colored urethane, each with varying durometers. Browse these categories under "Rollers & Bumpers"
Round, rectangular and square bumpers made from neoprene, nitrile and polyurethane.